On the 16th of July protestors against HS2, of all political persuasions, will rally at Westminster to give parliament the message to Stop HS2! Ruislip and Hillingdon Against HS2 will be there with many others making sure parliament breaks up for the summer with the message that HS2, a £36bn vanity project of epic proportions, is becoming less credible by the day ringing in their ears. Just last week the Public Accounts Committee highlighted serious concerns about HS2. We are glad a parliamentary committee has finally taken the fatal flaws in HS2 seriously. We have of course been making these points all along. We now need Justine Greening and the Treasury to do some sensible sums but unfortunately while we wait for them to come to their senses, millions of tax-payers money is being wasted on HS2 Ltd. (a company set up by the government for the government) as they pay themselves over-inflated salaries to push this project ahead regardless, on behalf of those with vested interests. The business case is falling by the day with a BCR of under £1 for every £1 spent! This week’s Midland Mainline electrification announcement just reduces the case and need for HS2 further. It also underlines how incremental upgrades to routes and capacity will benefit ordinary tax –payers more quickly and at a lesser cost. As multi-million pound contracts for big construction companies are announced by HS2 on a weekly basis – innocent home-owners blighted by HS2 are still waiting the start of a compensation consultation. Justine Greening is choosing to put thousands of lives literally on hold while the government play with a fantasy giant train set. The reason being they can’t afford reasonable compensation as it reduces the business and economic case further. This is a project the public simply don’t want. If you ask anyone during these times of major cuts what they would want their taxes spent on it would be education, the NHS, policing or armed forces – not high speed rail. Other countries are seeing the light and pulling the plug on such projects before they spiral into further debt. Now we challenge the Office of Budget responsibility and the Treasury to scrutinise HS2 and make the right decision and Stop HS2 before another penny is wasted! 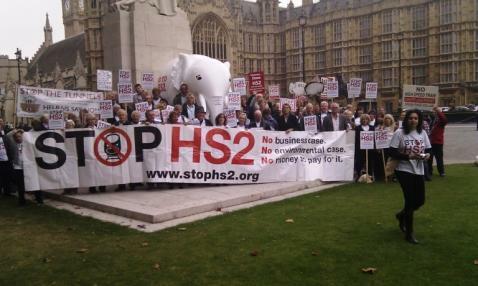 Protestors against HS2 from Hillingdon, Ruislip, Ickenham, Harefield, Ealing, Brent, Camden, Euston and Westminster will be in Old Palace Yard, Westminster from 12-2 tomorrow to raise their concerns with their MPs. Watch the Ruislip Against HS2 facebook page and @MrsKeriBrennan on twitter for updates throughout the day.